High precision transducers are increasingly in demand due to high-performance industrial applications such as precision motor controllers, metering, measurement accessories and test equipment for medical equipment such as scanners and MRI machines. High precision transducers are increasingly in demand due to high-performance industrial applications such as precision motor controllers, metering, measurement accessories and test equipment for medical equipment such as scanners and MRI machines. Most of these applications currently use high precision transducers with a limited temperature range of +10 to +50˚C. But many newer applications, such as automotive tests benches, require accuracy across a wider range of temperatures. LEM has been producing high-performance transducers at competitive prices for standard markets for years, so overcoming performance challenges like this is nothing new. Determined to build a transducer that maintains high performance standards over a wider temperature range, LEM developed the IT xx5 Ultrastab series—IT 65-S, IT 205-S, IT 405-S and IT 605-S—featuring accuracy and reliability at ambient temperatures from -40 to +85˚C. 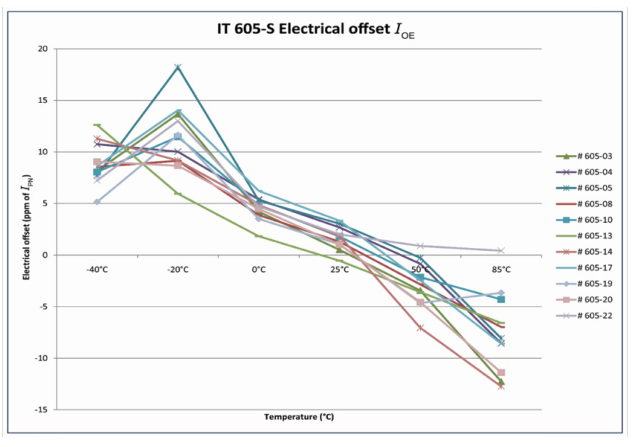 Fig 1: The Ultrastab IT xx5 high performance current transducers series. In addition to providing high accuracy across the entire temperature range, IT xx5 transducers are able to measure DC, AC, pulsed and complex signals, as well as provide galvanic isolation between primary (high power) and secondary circuits (electronics). Despite their compact size, they easily match today’s power electronics requirements in terms of EMC protection, with excellent immunity against external electric, magnetic and electromagnetic fields. 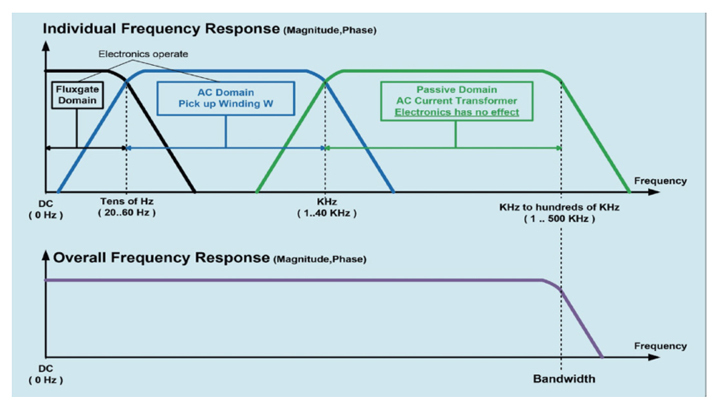 They also meet other mandatory requirements needed for targeted applications, including low emissions, fast response time, large bandwidth, low phase shift and low noise. The IT xx5 Ultrastab series uses fluxgate technology with a self-oscillating frequency. Even if the fluxgate frequency changes slightly, this technology guarantees a correct saturation of fluxgate, regardless of the temperature fluctuations and aging of the environment. Overall, the quality of design and manufacture guarantees high reliability and long life. LEM design demands high reliability levels even in harsh conditions or widely varying temperatures. These include keeping a maximum junction temperature below +125˚C at maximum ambient temperature, minimum burden resistance and maximum supply voltage. Added potting material dissipates power loss and avoids any hot spots around the electronic components. Fig 2: Ultrastab IT xx5 series technology. Measurement accuracy not only depends on the accuracy of the measuring resistor but also on the sensitivity of the flux detector. 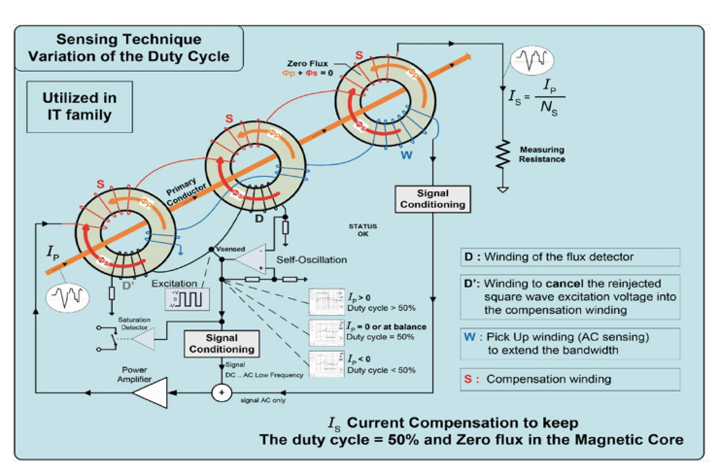 As winding D of the flux detector is coupled with secondary (compensation) winding S, the applied square wave voltage is re-injected into the secondary (compensation) winding and creates a parasitic current in the measurement resistor. The square wave voltage induced in the S winding by this flux is compensated by second D’ winding (identical to D) mounted on a second detector core inside the secondary winding S. The residual flux (the sum of the opposed fluxes in D and D’) will create very small voltage peaks that cause the remaining signal to correlate with the fluxgate excitation. The magnetic part of the transducer is represented schematically by the three cores in Figure 2. A fourth winding W is wound in between the compensation winding S on the main core to extend the frequency range of the transformer effect to lower frequencies. The fourth winding is connected to an integrator that modifies the output current via the power amplifier to compensate for the too small induced voltage in a frequency range too high for the fluxgate detector. The characterization results in Figures 3 and 4 show the Ultrastab IT xx5 series performance across its entire operating temperature range of -40 to +85˚C. 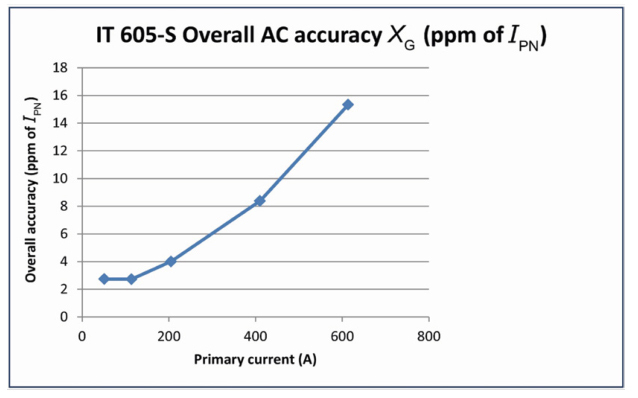 Figure 5 illustrates the very low offset drift and almost no linearity drift over the entire temperature range, resulting in a global accuracy lower than 30 ppm from -40 to +85˚C ambient temperature. Performance was measured during type tests with high enough quantities for ±3σ value calculations to guarantee the values given in the datasheets. Due to the iron-nickel magnetic core and a perfect homogeneity of the winding process, overall AC accuracy is very good. 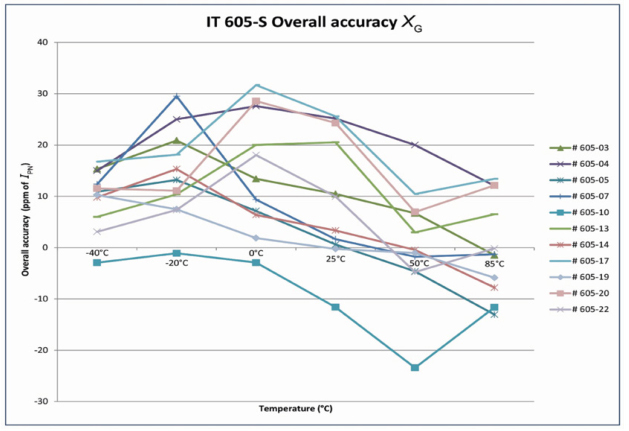 Figure 6 below shows the overall accuracy in AC at room temperature for the IT 605-S. 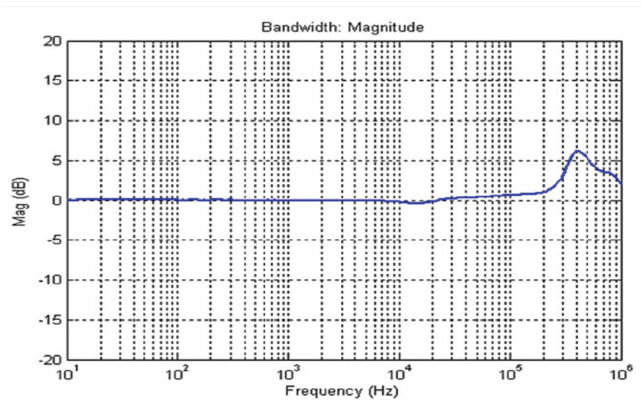 This material and specialized winding process also help the series achieve a large bandwidth and a very low phase shift, as shown in Figures 7 and 8. • Fluxgate for DC up to low frequencies of a few Hz. • AC pickup winding W working like a Rogowski coil, starting at very low frequencies and compensating for the small error created by the current transformer. • Current transformer working up to few hundred kHz. LEM’s IT Ultrastab current transducer series have been used for years to accurately analyze power and calculate efficiency along a limited temperature range of +10 to +50˚C. The new IT xx5 Ultrastab series offers the same functionality over a wider operating range, from -40 to +85˚C. One application requiring this wider range of operating temperatures is testing and measurement equipment. In addition to proving efficiency at ambient temperature with test benches, efficacy throughout the operating temperature range can be determined with real use cases when qualifying the efficiency of power electronics- based equipment such as inverters for hybrid and electric vehicles, wind and solar power systems, or industrial inverters and motors. 1. The accuracy of the measured current and voltage (amplitude error). 2. The phase error coming from the phase shift between the voltage and the current. Current measurement above few amps requires high accuracy current transducers interfacing with the power analyzer. 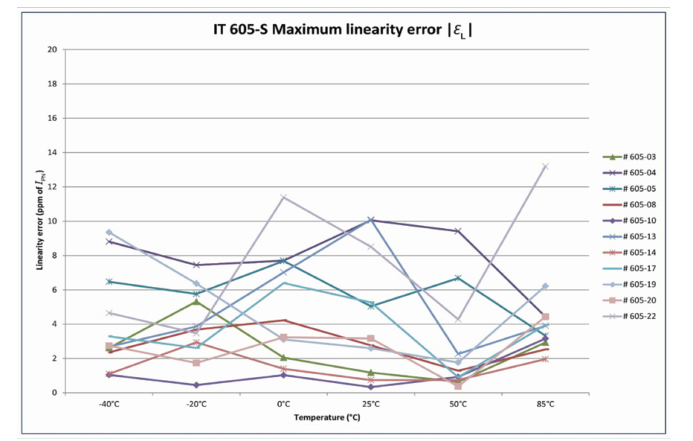 Even minimal phase error can have a devastating impact on power factor correction. Power meters must also be highly accurate in order to measure power at the input and output of the equipment under test. Losses and efficiency cannot be measured directly, and must be derived using measured metrics. The inherent error associated with these direct measurements is cumulative and compounding, and should be minimized whenever possible. Only high-precision instruments and current transducers coupled with power analyzers can deliver reliable and acceptable results. The new LEM Ultrastab IT xx5 series meets all the requirements for accurately measuring power over operating temperatures ranging from -40 to +85˚C. Various models in the series range from 36 to 400ppm for offset in temperature and from 8 to 12ppm for linearity in temperature. Other transducers lose accuracy and reliability of readings when at 10% of the total rating of the device, requiring additional devices to provide accurate measurement for lower currents. Boasting a small offset, tight linearity, and parts-per-million accuracy, the IT xx5 series will provide reliable measurements along the entire measuring range of the device eliminating the need for additional devices. 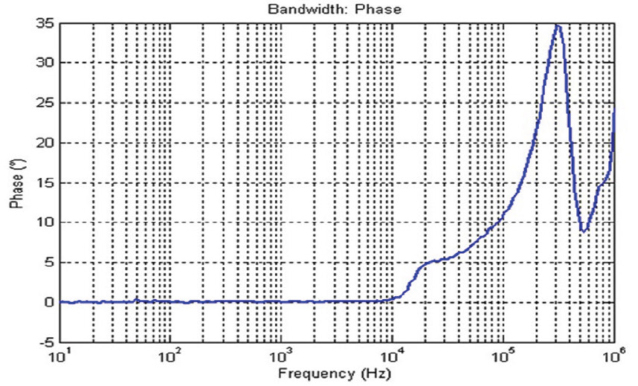 The phase error of each of the IT xx5 transducers is well below one minute, or 1/60 degrees. They are all galvanically isolated, and DC calibrations are possible up to 16000A thanks to LEM’s ISO 17025 certified laboratory. LEM is the market leader in providing innovative and high quality solutions for measuring electrical parameters. Its core products - current and voltage transducers - are used in a broad range of applications in drives & welding, renewable energies & power supplies, traction, high precision, conventional and green cars businesses. LEM’s strategy is to exploit the intrinsic strengths of its core business, and to develop opportunities in existing and new markets with new applications. LEM is a mid-size, global company. It has production plants in Beijing (China), Geneva (Switzerland), Machida (Japan) and Sofia (Bulgaria). With its regional sales offices close to its clients’ locations, the company offers a seamless service around the globe. LEM is listed on the SIX Swiss Exchange since 1986; the company’s ticker symbol is LEHN.